For his new novel The Severed Streets, the second installment of his Shadow Police series, acclaimed writer Paul Cornell decided to include author Neil Gaiman as a significant character. In this essay, Cornell shares why and how he went about making his fictional Gaiman. I'd just been in a head on car crash, which my wife and I had miraculously survived, but now I was back at my desk. It was the early hours of the morning, and, having been discharged from Accident and Emergency, we'd just spent an hour getting up the stairs to our front door. Dawn was breaking, and I felt bloody lucky to be alive, and I wanted to send some emails, tell people. That was when the phone rang. 'Hello,' said a soft voice on the other end of the line. 'Who is this?' I asked. In the circumstances, I thought that might be an instruction. Perhaps fortunately, it was one that my body was at that point incapable of carrying out. 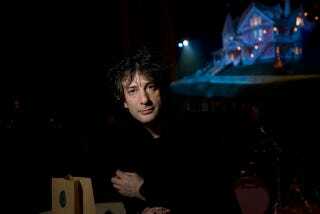 I do wonder if Neil Gaiman is still bemused by why I treated him that night like the voice of a higher power. Mind you, I swiftly realised that a higher power wouldn't have been calling seeking advice on his Doctor Who script. And hey, wasn't that great news, that Neil Gaiman was writing a Doctor Who script?! Not that I could leap up and down. We met at a convention, and I was immediately rather pleased by him: the way he prized friendship, and found fame beside the point, and sometimes pretty annoying, and so tried to only do good things with it. He's one of those wise famous people who realises that the room changes when he enters it, and is more interested in what it was like before he arrived. We went to visit his house, which is about a third vast geek den, a third something Vincent Price should have lived in, what 'the Gaiman house' should be, and a third comfy lived-in space. He was sleeping on a couch downstairs to keep company with a beloved dog, who was ill. He took us to see his bees, for which we had to wear full white bee suits with mesh face shields. (When I mentioned the bee suits at a convention, a fan in the audience said 'you mean you were dressed as a bee?') It was on the way back from this sweaty and slightly scary learning experience that I started to think that perhaps my idea about putting a real person into the novel I was plotting, The Severed Streets, might work best with the famous person all in black I was walking behind at that moment. So I asked, and he laughed, and to my amazement, after hearing more about my plans, he said yes. 'I mean so you've got, I mean you must have... to get down those stairs...' Quill pointed to his own eyes. 'Of course. Of course. Myself, I got it when I touched a pile of soil. But of course it's not... always that. Is it?' Arrgh. Why couldn't he just talk normally to this bloke? Quill's reaction (he goes away and comes back a couple more times, each time more awkward than the last) is rather like my own when meeting anyone remotely famous. I see no reason why I can't be calm and businesslike, and then utterly fail to be. Thankfully, as with Neil, it eventually wears off. I think maybe he views that process as 'talking them down'. If Neil's part in the book were limited to that cameo, then I don't think I'd be particularly proud of it. Having once been someone who revelled in in-jokes, I've now become rather allergic to them. (Putting a reference to one movie in another so we geeks can spot it: not actually funny, therefore not actually a joke.) But Neil appears several times more, and, as I hope becomes obvious, is pretty much integral to the theme and structure of the novel. I like to think that, though these are supernatural thrillers that sprint along, they're also quite serious books, with a bit of oomph to them, and, not wanting to give anything away, Neil's role is part of that. Neil read through all the passages he's in (don't hold him responsible for any he's not), and gave us his blessing. I'd been paying a lot more attention than normal to his speech patterns and body language, which must have been a bit creepy. As I read the section above to the launch event audience at London's Forbidden Planet, I realised a moment before I got to the sentences involved that I was going to have to impersonate him. I think I just about got away with it. I have no idea what we'll do if the TV version we're working on gets made. I like to think he'd be up for reprising his role. Who else could we cast? As people started to read the novel, I've been sent several startled and even accusatory tweets, basically echoing the sentiments of my copy editor, who put an enormous red ring around Neil's first appearance and wrote YOU HAVE ASKED HIM, RIGHT?! in the margin. Although real people have been deployed in genre novels before (it'd be cool to hear about some of those in the comments), I think what they're reacting to is the way Neil's used as a character, which is a bit of a first. I'm delighted that Neil's given the opportunity to complete a project that was pretty conceptually scary, but then, he's been there at for couple of my life's more frightening moments. Photo Credit: Darryl James/Getty Images.